When Disney changed the title of its megabudget sci-fi film from John Carter of Mars to the considerably less evocative John Carter, fans were up in arms, and the scuttlebutt behind the name change infuriated them more: Supposedly, studio executives made the snip because they were afraid women wouldn’t go to see a movie with Mars in the title. But why lay that marketing decision at the feet of a single gender? Mars has been a cinematic deterrent to both sexes for the last two decades, and the amount of Mars-related flops could fill a crater. Consider the intragalactic evidence! Last year’s animated feature Mars Needs Moms was a famous bomb so big that it took down an entire company. The early-aughts rush to pump out expensive Mars movies was just as disastrous: Mission to Mars barely grossed $60 million, Red Planet took in around half that, and Ghosts of Mars was such a demoralizing failure that it took director John Carpenter nearly a decade to make another feature. One of the Rock’s rare flops? The Mars-set Doom, which only made $28 million. The lowest-grossing Tim Burton movie of the last fifteen years and change? That’d be Mars Attacks! The John Cusack drama The Martian Child wasn’t even set on Mars, and it, too, is the lowest-grossing wide-release movie Cusack has made in the last fifteen years. Why are audiences so turned off by our planetary neighbor? They don’t seem to have the same hang-ups about the moon, which has factored into big hits like Transformers: Dark of the Moon and Apollo 13 (as well as critically acclaimed movies like Moon), but that rock is movie-ready: Stories set there simply have to be told in romantic black-and-white. Meanwhile, setting your movie on red, red Mars is like staring into a Virtual Boy for two hours, and who wants that? (Evidently not John Carter director Andrew Stanton, whose Mars is more tan than red.) It helps, too, that the moon is such an ever-present presence in our lives, as well as a place that Americans have actually been. If NASA can’t motivate an administration to send a man to Mars, why should the average moviegoer get worked up about it? 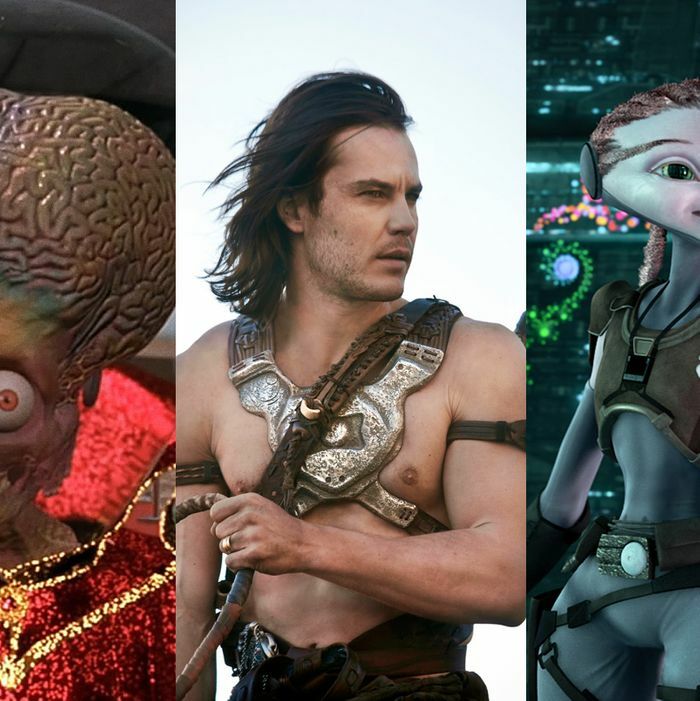 If John Carter can’t reverse the box-office trend — and early tracking reports aren’t optimistic — it seems the red planet will have to fall back on its one unmitigated success: Total Recall, the 1990 Arnold Schwarznegger classic that’s heavily set on Mars. Still, even that movie’s legacy doesn’t go very far. When the synopsis leaked for the upcoming remake (set for release in August and starring Colin Farrell), fanboys scratched their heads: It’s set wholly on Earth! Can you even make a new Total Recall without leaving the planet? Apparently, you can — and can you blame them? When it comes to the box office, there’s very little life on Mars.